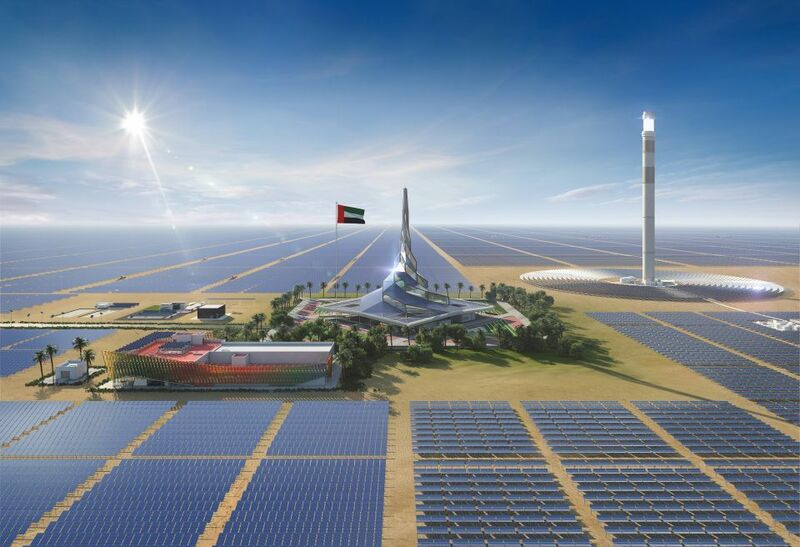 Noor Energy 1, the 950MW CSP+PV solar power project in Dubai, is now absolutely a shining star in global solar thermal power industry as it broke a dozen of world records in solar CSP history. The Dubai 950MW CSP+PV solar complex is the fourth phase of Mohammad Bin Rashid Al Maktoum Solar Park in Dubai, which will reach a total capacity of 5,000 megawatts (MW) by 2030. Noor Energy 1 takes use of three technologies to produce 950MW of clean energy — 600MW from three parabolic trough CSP plants, 100MW from a solar tower, and 250MW will be generated from photovoltaic panels. 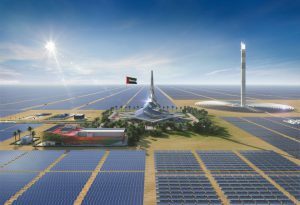 As CSP Focus reported earlier, the base concrete of the CSP tower has been completed this March, and the work is progressing according to the set timetable for this project that will contribute to Dubai’s transformation into a global clean and renewable energy hub, and accelerate its shift towards solar power. The expected construction duration lasts 48 months, meaning the overall 700MW CSP project will be completed by the end of 2022 in four years. Separately, the first parabolic trough CSP plant is planned to be operational on August 21, 2021, in 32 months, tower CSP plant finished on November 21, 2021 in 35 months, and the second and third parabolic trough plants to be completed by the end of the year of 2022. It also achieved the lowest Levelised Cost of Electricity of USD 2.4 cents per kilowatt hour (kWh) for the 250MW photovoltaic solar panels technology, and 2.9 cents in daytime, 9.2 cents in night time for the 700MW CSP technology, the lowest worldwide. The development and construction of the CSP “star project” is led by Saudi Arabia’s ACWA Power and China’s Shanghai Electric, up to date, most of the key technology and component suppliers have been confirmed, including several Chinese engineering, construction and manufacturing firms like Northwest Electric Power Design Institute for Tower engineering, Inner Mongolia Electric Power Survey and Design Institute for Trough engineering, and Energy China for installation. And most of the steel structure for this project is coming from Saudi companies: Tadawul-listed Al Yamamah Steel to supply steel, and Al-Babtain Power & Telecom to supply CSP Solar Structures. As the unique professional conference for global CSP peers focusing on MENA region, the 4th CSP Focus MENA 2019（Jun.26-27, Dubai）will be in Dubai again. The project key participants like DEWA, ACWA Power, Shanghai Electric, Abengoa, BrightSource, Empresarios Agrupados, Power China will be attending the event, together with other MENA CSP industry peers like REPDO, Saudi Electricity Company, New and Renewable Energy Authority, KISR, MASEN, TSK, SENER, SEPCO 3, EDF, China Shipbuilding New Power, SUPCON Solar, Royal Tech CSP, Thermax….